The Lunar New Year celebration lasts 15 days so there’s still plenty of time to eat your fill of lucky and auspicious foods for a prosperous year ahead. Egg rolls (also called fried spring rolls) are a favorite all year round but they’re considered an auspicious food during the new year because they resemble gold bars and thus symbolize wealth and prosperity! I’ve adapted this lumpia (Filipino egg rolls) recipe from The Asian Grandmothers Cookbook. I used carrots because in Mandarin, orange carrots are called hong luo bo (红萝卜), i.e. “red carrots,” and red symbolizes good fortune, while the yellow carrots are close enough to a golden hue and gold symbolizes wealth. Chinese chives are known as jiu cai (韭菜) which sounds like “forever vegetable,” and who doesn’t want a long life? Feel free to add or subtract whatever ingredients you’d like. Ground pork, glass noodles, cabbage, bamboo shoots, mushrooms, etc., are all great ingredients to add to the mix. The filling can be made ahead and stored in the refrigerator for up to 3 days. To make the filling, place the chicken in a medium saucepan and fill with water until the chicken is submerged by about an inch. Add 1 teaspoon of the salt and bring to a boil over high heat. When the water starts to boil, turn off the heat and cover. Let the chicken stand for 15 minutes. Test by cutting into a piece: it should not be pink. Let cool and shred the meat along the grain into tiny shards with your fingers, or chop into a confetti-sized dice. Reserve the stock for another use or discard. In a small skillet, heat the 1 tablespoon oil over medium-high heat until it becomes runny and starts to shimmer. Add the onion and garlic and cook until the onion is soft and light golden, 4 to 5 minutes. Add the chicken, carrots, and green beans, and stir to mix. Add the soy sauce, remaining salt, and 1 teaspoon pepper (or to taste) and mix thoroughly. Add the Chinese chives and stir and cook until the mixture is heated through. To assemble the egg rolls, carefully peel one wrapper from the stack (cover the remaining wrappers with a damp cloth to keep them moist). Lay the wrapper on a dry work surface with one corner pointing toward you.) Place 2 tablespoons of filling just below the center line of the wrapper parallel to your body. Shape it into a mound 1 by 3 inches, leaving about 2½ inches on either side. Fold the corner closest to you over the filling and tuck it under snugly. Roll once, then fold the left and right sides in to form an envelope. Continue to roll the filling tightly into a fat tube until you reach the end of the wrapper. Before you reach the end, dab some egg white or water along the top edge to seal the egg roll. 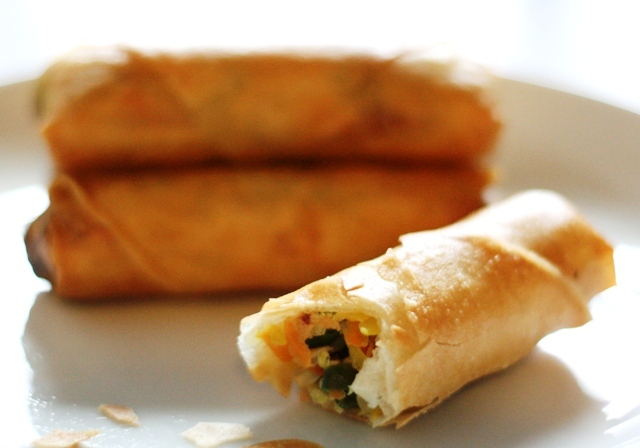 The egg roll should measure 4 to 5 inches in length and 1 to 1½ inches in diameter. Place on a plate or tray and cover with a damp towel or plastic wrap. Repeat with the remaining filling and wrappers. Preheat the oven to 250 degrees F. Line a plate with paper towels. In a large wok, heavy skillet, or Dutch oven, heat the 3 cups oil over high heat until it reaches 350 degrees F on a deep-fry thermometer. Reduce the heat to medium-high. Using tongs, gently lower the egg rolls into the oil one by one; fry in a batch of 5 or 6 until both sides are evenly golden brown, 1 to 2 minutes. Remove the egg rolls with a slotted spoon, shaking off excess oil, and drain on paper towels. Keep warm in the oven. Bring the oil temperature back to 350 degrees F before frying the next batch. Repeat with the remaining egg rolls. Serve immediately with sweet and sour sauce. In a small saucepan, bring the vinegar, sugar, ketchup, and soy sauce to a boil over medium heat. Stir the cornstarch slurry and add to the pan, stirring constantly until the sauce thickens, about 1 minute. Pour into a small bowl and serve with the egg rolls. 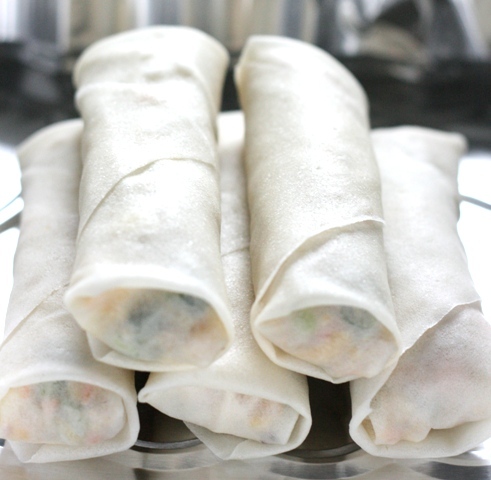 Keep your egg roll wrappers frozen and defrost in the refrigerator for an hour or two, or on the counter for 3o minutes. If your wrappers dry out, cover with a damp towel and microwave on medium for 10 seconds. They should soften up but work quickly before they dry out again and keep covered with a damp towel! Allow your filling to cool completely before wrapping your egg rolls. A warm filling may cause your wrapper to soften and tear, and your egg roll to fall apart. Don’t overfill your wrapper or #3 will happen. Make sure your oil is at the optimum temp before you start frying. Otherwise your egg rolls will come out soggy instead of crisp. When frying, don’t overcrowd your pan, otherwise #5 will happen. You can freeze unfried or fried egg rolls. Lay them out in a single layer on a cookie sheet and freeze them for about an hour. Then transfer them to a ziptop bag and freeze for up to three months. When ready to eat, deep-fry the frozen egg rolls (don’t defrost) for 2 to 3 minutes (pre-fried) or 5 to 7 minutes (unfried). To warm up fried egg rolls (that have been refrigerated or kept at room temp), preheat your oven to 325 degrees F and heat for 8 to 10 minutes, or until crisp. Previous postIndonesian-Style Pineapple Tarts for Chinese New Year! near post. Thank you 1,000,000 and please continue the enjoyable work. Pat, these look so amazing I can’t wait to try them! I’ve had some difficulty with eggrolls in the past – mostly with looks, not taste, and I think, after reading your hints it’s because my filling was warm! Who knew?? I also always sealed the whole egg roll, which maybe caused steam to build up inside, instead of just sealing the tip like in youir video! You were great, by the way! Thanks Frugal Hausfrau! I hope your eggrolls turned out better after following some of my tips. Pat, just watched the TV clip– nice job!